When a visual and small screen admin refresh was introduced in 3.8 (by way of the feature plugin MP6), the admin font was changed to Open Sans to better complement the redesigned vector iconography. This change was not without its bumps or controversy, notably around extended character sets and that it is loaded from Google Fonts for a variety of reasons. Open Sans is no longer necessary. I originally introduced it into Core via MP6 because there were not good system fonts common to all platforms at the time. In the years since, Windows, Android, OS X, iOS, Firefox OS, and various flavors of Linux have all gotten their own (good) system UI fonts. 36753.diff​ (14.7 KB) - added by helen 3 years ago. 36753.2.diff​ (15.9 KB) - added by helen 3 years ago. 36753.3.diff​ (15.4 KB) - added by helen 3 years ago. 36753.4.diff​ (26.5 KB) - added by netweb 3 years ago. 36753.5.diff​ (26.5 KB) - added by netweb 3 years ago. 36753.6.patch​ (1003 bytes) - added by walbo 3 years ago. 36753.7.patch​ (4.0 KB) - added by walbo 3 years ago. bold-font-weight-heierarchy-issue-chrome-windows.PNG​ (5.4 KB) - added by celloexpressions 3 years ago. 36753.patch​ (696 bytes) - added by iseulde 3 years ago. Screen Shot 2016-06-03 at 14.40.18.png​ (476.8 KB) - added by iseulde 3 years ago. Screen Shot 2016-06-03 at 14.40.59.png​ (474.3 KB) - added by iseulde 3 years ago. wp system font screenshots.zip​ (6.6 MB) - added by helen 3 years ago. #36753.patch​ (12.0 KB) - added by coderste 3 years ago. 36753.2.patch​ (4.8 KB) - added by coderste 3 years ago. 36753.3.patch​ (52.6 KB) - added by coderste 3 years ago. 36753.4.patch​ (52.6 KB) - added by coderste 3 years ago. screenshots_windows8.1_20160628.zip​ (435.5 KB) - added by Markus Pezold 3 years ago. addendum.patch​ (35.3 KB) - added by Presskopp 3 years ago. WP-fontsize.jpg​ (336.2 KB) - added by Presskopp 3 years ago. 36753.dashboard-windows-xp.png​ (63.0 KB) - added by SergeyBiryukov 3 years ago. 36753.dashboard-windows-7.png​ (59.2 KB) - added by SergeyBiryukov 3 years ago. 36753-chrome-ubuntu-15.04.png​ (269.6 KB) - added by metodiew 3 years ago. 36753-tabs.patch​ (714 bytes) - added by ocean90 3 years ago. 36753-coding-standard.patch​ (26.4 KB) - added by ocean90 3 years ago. I've been running the plugin on my dev site for a while now and Don't Hate It™. Patch attached - I removed the font face declaration in a place or two that seemed unnecessary, but generally we seem to only have them where we really need them. My inclination here is to commit this now and then tweak as we go during the cycle to get as many eyes over time as possible. Linking for posterity: ​https://wordpress.slack.com/archives/core/p1462295498002997 and ​https://github.com/mattmiklic/system-fonts-in-wp. I'm all for an early commit as a way to enforce testing and surface issues, but I do think we should document the change visually with screenshots uploaded to this ticket of at least say the dashboard on every major OS (maybe Widows, OSX, Android, and iOS would be enough initially). There are comprehensive screenshots for the .com side, but I haven't seen any for .org yet outside of the OSX ones on the feature project page. Feels weird to commit a major change like this without at least some visual documentation (even before/after), even if it's been discussed and tested extensively already. I have asked some people to help out with screenshots but nothing yet, I am not currently in a position to do it myself. Please feel free to add some as well. 36753.3.diff​ no longer removes the open-sans style registration. I was blinded by my dislike of those translation hacks and forgot about people using the handle, especially as a dependency where it would cause the calling style to not be output. Drop Open Sans in the admin in favor of system fonts. Rejoice, for your admins will feel more native to your surrounding computing environment and likely load faster, especially when offline, as they no longer have to talk to The Google Overlord. At the time of introduction in 3.8, there were not good system fonts common to all platforms at the time. In the years since, Windows, Android, OS X, iOS, Firefox OS, and various flavors of Linux have all gotten their own (good) system UI fonts. There will definitely be visual bugs, mainly around alignment and spacing; these should be documented and reported on the ticket and fixed more atomically so that our current and future selves have a better understanding of what happened and why. The style remains registered, as it is almost certainly in use by themes and plugins. @helen in 36753.4.diff​ I removed the quotes around font names that are not required per the CSS standards. p.s. I've no idea what's going on with the src/wp-includes/js/tinymce/plugins/compat3x/css/dialog.css, in the diff, tried on develop.svn, develop.git, and GitHub/WordPress to get a "normal" looking diff for that file to no no avail! Revive grunt-rtlcss, which does not appear to enjoy syntax errors. Native screen resolution is 3840x2160. Display scaling is set to 250%. Looks like there is an 1px offset on the tab bars in the categories meta box and on the tab bars i menus. See ​https://cloudup.com/cZL5BOgDR9x. in 36753.4.diff​ I removed the quotes around font names that are not required per the CSS standards. I am oddly torn about these quotes. I think what I like about them is that they separate named fonts from system aliases. But, of course, being inconsistent with standards and internally is not good. Any thoughts on that? I think it's a matter of dealer's choice, really. Font family names that happen to be the same as a keyword value ... must be quoted to prevent confusion with the keywords with the same names. So, quoting them is not necessary, but it does prevent any type of ambiguity. As long as you ensure that you do not accidentally quote these fallback keywords: inherit, serif, sans-serif, monospace, fantasy, cursive, initial, and default. The general standard I've seen elsewhere on the web is to only quote font names that have non-alpha characters in them, such as whitespace or hyphens. I think this usually is to prevent accidental quoting of the fallback keywords, since if quoted, those plain don't work, and since they're always default fallbacks, they may not be as rigorously tested on many platforms. Looks like -apple-system as the first font in the stack when using the shorthand CSS property font causes problems in MSEdge/IE and the property doesn't get applied ​https://cloudup.com/cXXnwUoHhbX. Currently the stylelint rule I'm using is "font-family-name-quotes": "double-where-recommended", which does only wrap quotes around font names with whitespace in them, we could change that to "font-family-name-quotes": "double-unless-keyword", which would satisfy your suggestion and would quote all named fonts, and not system aliases. Been digging around trying to find if this behavior is a known issue or not, @walbo you didn't happen to see this documented anywhere did you? Here's a screenshot of Firefox 46 in Arch Linux running 4.6-alpha-37367 showing the Ubuntu font. I've read, you want some more screenshots from other systems. Not sure, if this is the best place for them, I just drop them here. Looks fine! Thanks a lot! I am using Ubuntu 14.04; Google Chrome Version 50.0.2661.94 (64-bit). After Open Sans is removed, bold titles seems quite thicker and not so pleasant. Title color seems darker than earlier, may be due to the boldness, I am not sure. Didn't find anything on it. Looks like the problem is the hyphen at the start of the font name. Tried to quote -apple-system and that seem to solve the problem as well. Admin font: Remove a redundant sans-serif declaration. I noticed an issue in the customizer where text that has font-weight: bold is now bolder than text with font-weight: 600 where they previously used the same font weight. In the case screenshoted above, this causes a visual reversal of the font hierarchy hierarchy (which also has a slightly smaller text size, but is now bolder). I believe that this happens because bold is equivalent to 700, whereas we didn't have a 700 weight of Open Sans so it used the 600 weight when bold was used. In my case on Chrome/Windows, Segoe UI must have both weights. We will need to start being much more careful about usage of font weights since there may be variations across systems. My suggestion would be to update our CSS guidelines to require use of numerical font-weights. We also need to audit current uses and adjust them accordingly. Should I create a new ticket for this, or can we do it here? Will need to happen in 4.6 since the change causes issues at least in one spot so far. Awesome, currently we then have two workarounds, switch to the non-shorthand font-family or continue using the shorthand font and quoting "-apple-system". I'm leaning towards later and quoting "-apple-system", maybe get that into /trunk so further iterations and bug/regression testing can occur? Quoting -apple-system will make that property fail to work in Safari; it has to be unquoted to work properly. That's why my plugin uses the font-family property instead of the font shorthand. That method works in all browsers I've tested. Makes sense, we can do it here for now. System font: The stack does not work with the font shorthand property. Worth to mention that cssmin is changing it to font-family:-apple-system,BlinkMacSystemFont,"Segoe UI",Roboto,Oxygen-Sans,Ubuntu,Cantarell,"Helvetica Neue",sans-serif;. Auditing current usage and standardizing on a handful of weights is a good idea. When I initially made this change on WordPress.com, I noticed in a few places, fonts were displaying super-thin or super-thick, because they'd been specified with a font-weight of something like 100 or 900 in CSS. Because we only loaded the 300, 400, and 600 weights from Google, we never noticed until we switched back to system fonts. The SF typeface on iOS and MacOS has nine weights. On Windows, there are five weights of Segoe UI. It's less of an issue on Android/ChromeOS, which only makes two weights (regular and bold) of Roboto available on the web (more weights are available in native Android apps, but only those two load in Chrome/Android). Not sure about the Linux flavors, off the top of my head. You can use ​the test page I created to compare weights of Open Sans against your current device's system fonts. We have a fix for this internally and it is currently going through code review. It should roll out with Edge 14 in a couple months. There should be a preview build available in the insider track in a couple of weeks, too. @walbo: Also, sorry about forgetting your props :( I will make a note to add you to the next commit here, and if I forget again, somebody can manually add you to the credits. Now that we're using system fonts it would be easy to use them as the default font for the visual editor too, instead of Georgia. In my opinion it looks cleaner and it matches better with the rest of the admin. I attached before and after screenshots and a patch for those who want to test. Note you'll have to disable editor styles or use a theme that does not add any. Now that we're using system fonts it would be easy to use them as the default font for the visual editor too, instead of Georgia. In my opinion it looks cleaner and it matches better with the rest of the admin. There's no technical or design reason that using the system UI font for the editor wouldn't work, though I'll offer one reason why we didn't go this route on WordPress.com. Since the idea was to use system fonts for the sake of looking more native, we confined them to user interface elements. For content, we continued to use a serif typeface. This creates a clear typographic distinction between text that's part of the UI (like a button, menu item, or hint) and text that's content on your site (like a post or a comment). Either way can be the "right" way to go -- just wanted to lay out this reasoning in case folks think that a similar distinction would be useful to make here. Thanks for the comment! I agree that both can be right and I'm not saying that we should, but we could. I don't have a strong opinion either way. wp system font screenshots.zip​ contains mostly-generated (via Browserstack or in some cases Browsershot) screenshots of the test page. Notably, the Linux ones are terrible and could use contributions from better sources. Core admin loaded 300 (light), 400 (normal), and 600 (semibold) for Open Sans. Press This loaded 400, 600, and 700 (bold). Some insight into the decision to use 600 and 700 may be helpful but doesn't seem critical. @michaelarestad? 300, 400, and 700 are pretty consistently still the best matches across browsers and OSes. 600 is more varied and is what was noted as seeming too heavy. There are a significant number of browser/OS combinations in which 500 is a better match for 600; however, there are also many combinations where 500 is the same as 400 (normal) text (visually and/or technically), which seems far worse for information architecture than text that's heavier than it was previously. In terms of a patch, this means that normal should be changed to 400 and bold to 600 everywhere but Press This (which may already use all-numeric declarations). Since the idea was to use system fonts for the sake of looking more native, we confined them to user interface elements. For content, we continued to use a serif typeface. This creates a clear typographic distinction between text that's part of the UI (like a button, menu item, or hint) and text that's content on your site (like a post or a comment). This is solid reasoning; let's keep the default editor font a serif. See comment 39 for a remaining task on this ticket. The patching of font weights would make a good task for someone new to contributing. Since Press This was loading the 700 weight, bold should be changed to 700 instead of 600 in press-this.css. I'm going to just make that tweak before committing so this doesn't continue to sit, just wanted to note that. Actually, I missed this - @coderste, patches should be generated from the root of the install, otherwise patch will prompt you to specify the location of each file, since there can be (and are) multiple files with the same filename in different directories. Additionally, there are some other files that need changing outside of wp-admin/css - any file that has that font stack defined should also be patched (based on a quick search, there are some things in wp-includes). So if you have a moment to add that to your patch as well as fixing the above about Press This, that would be great. Okay - patch for this also makes for a good first patch - don't mix it in with the font-weight changes though, please, as those should be two different commits. As for the wp-includes and press-this.css I have now made the changes and uploaded the new attachment. Use numeric font weights instead of keywords. When Open Sans was in use, the 300, 400, and 600 weights were loaded. 400 is the equivalent of normal; however, bold is equivalent to 700, not 600. With the move to system fonts, we need to be specific rather than relying on the lack of a 700 weight. Not all system fonts include a 600 weight; in those instances, they will use the bold/700 weight. The WordPress CSS Coding Standards have been updated accordingly. Nice, +1, now with those CSS Coding Standards being updated there are ~75 instances where font weight normal is used with the Dashicons font, e.g. font: normal 20px/1.6 dashicons;. I added some screenshots for Windows OS. I'm concerned that the font-size for Segoe UI on the Windows OS is a "little" too small. E.g. the Segoe UI 14px on Admin Menu or 13px (Dashboard-Widgets) is smaller/thinner then the Open Sans font. I did install 4.6b lately (Win7x64, Chrome), and my first impression was like "Uh, everything so small, but hey.., it's nice - wait, let me see how was it before, oh yes, bigger, however - I like it"
An short update about the font size on windows (Segoe UI). My screen resolution for the screenshots was 1920px x 1200px (WUXGA). So my concerns about the to "small" font size are only for these high resolution. Comparison screenshot of latest trunk on Windows 10/Chrome. Native screen resolution is 3840x2160. Windows display scaling is set to 250%. Only thing I notice is that the text colors seem slightly, I dunno, grayer than they should. It's not so much that the text is smaller, but that it appears smaller and slightly harder to read because of the contrast of the text against the background. Playing around with the font I must say it really seems a bit shriveled as it is now. I don't know if it's helpful - but I have created a small extension to Matt's text compare. 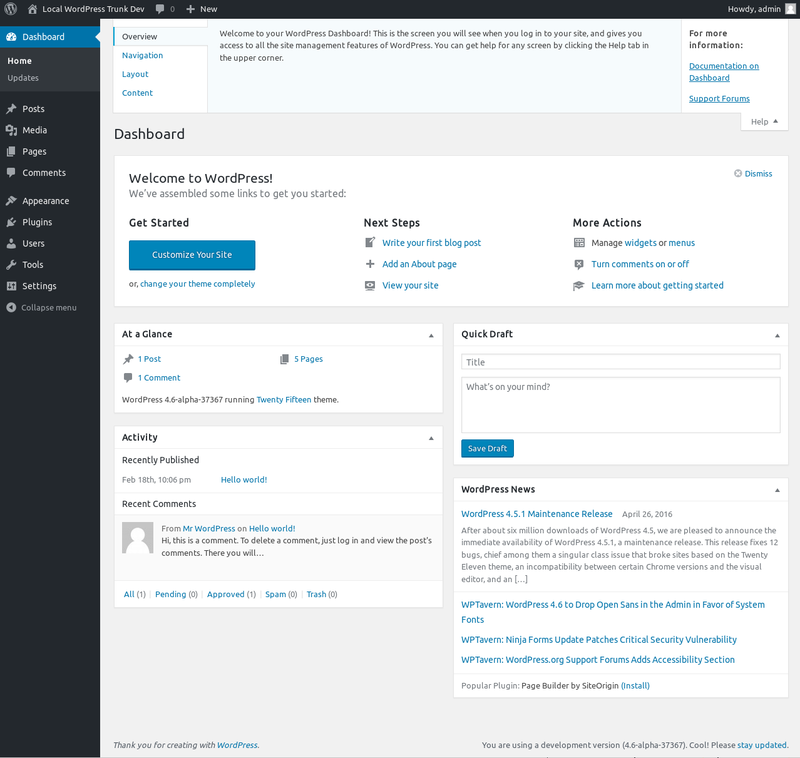 With font sizes and colors from the WordPress Dashboard. The red circled numerical indicators at the side of admin menu options - used to indicate, usually, updates - have off-centre numbers. In particular, the number 6 if way off (although, oddly, when 7 was showing it looked fine). I'm running 4.6 beta 2 and am seeing this on MacOS Sierra, Chrome. I haven't tested on any other browsers on Mac but, can. But, certainly, this doesn't happen on Windows and doesn't happen on WP 4.5 on the Mac. Do I need to make the change to the .min rather than that file for it to pick up? In that case, was your expectation that if I made that change to my site running 4.6 that I'd see that correction on refresh? Only, I've made it and it's not made a difference. Have I missed a step? Ah, well, that makes sense then. Apologies. Added screenshots of Dashboard in Firefox on Windows XP​ and Windows 7​. Both look good to me. @SergeyBiryukov Were those screenshots using the margin: 0 0 0 2px; CSS change, the XP screenshot shows the updates count bubble a pixel or two below where it should be, the plugin count bubble looks good though. Nope, they are from trunk as is. the XP screenshot shows the updates count bubble a pixel or two below where it should be, the plugin count bubble looks good though. Ah, seeing it now, thanks. Is it worth investigating GitHub's new font stack to see if there are differences and any problems that are reported? I removed Ubuntu and other Linux fonts from the new font stack yesterday afternoon. Should see a decent sans-serif now. I removed the specific Linux references to our font stack yesterday afternoon. *Shouldn’t* be seeing Ubuntu font now. Ubuntu, Oxygen, Cantarell, or Liberation Sans ;). Ah, okay, so you're running OS X 10.9 or earlier then, right? 5% of our users run 10.9 or older so I didn't look super close. I concur. Using i3wm, I set my own font stack to Deja Vu everything, and found it superweird WP was forcing Gnome's Cantarell on me. Just sans-serif is all good. Ubuntu is a very different looking font than the others in the stack. I noticed on github and wanted to come here to warn. I've been using 'Liberation Sans' in it's place in my font stack. It gets installed with LibreOffice which I've got to imagine is on most Ubuntu machines. It matches up nicely with the other fonts, even better than DejaVu. I've got some visual comparisons somewhere. I'll try to post a pic here. Found this issue the other day with fonts #37315. Github.com just rolled out a change to their fonts, placing -apple-system and BlinkMacSystemFont at the top of their font stack. On Mac, things look awkward. The attached screenshot clearly shows the text looking sensible in Safari and difficult in Chrome. In addition to being used on Github, DevTools uses the systemfont internally, and we've noticed some odd spacing/kerning/tracking in our text as well. I'm not aware of any concerns with the WP admin in the Ubuntu font; I wouldn't recommend changing it simply because that's what GitHub did (the contexts are quite different; GitHub's implementation of system fonts included using them for content (tickets and comments) instead of just for UI. I made a couple of screenshots comparing the Ubuntu font to the generic sans-serif fallback (DejaVu Sans) in Ubuntu. The relative strengths of those two typefaces could be argued at length, but clearly the Ubuntu font is a better match for native apps in Ubuntu. If the user has modified their system font, there's not much we can do about that given the current available methods of using system fonts on the web. Removing the three Linux fonts feels unnecessary to me, but I don't have a terribly strong opinion; I think we reach the point of diminishing returns quickly when debating typography on various flavors of Linux. Edited to add: also note that Ubuntu is a better size match for our fonts on other platforms than DejaVu sans. All screenshots were taken using a Macbook retina 15″ OS X El Capitan and a Dell laptop 1366x768 display with Windows 10. I've used the ​WordPress UI plugin as base and added some input/button elements (please ignore other elements). I'd suggest to don't focus on the alignment of the elements but rather on the alignment of text within the elements. Same applies to the "count bubbles" mentioned in previous comments and, I guess, wherever the line-height plays a role in determining the element's height/text alignment. Just wanted to bring up fonts on Linux again. I'm guessing there's been consideration to go github's route and say forget Linux, sans-serif for all. I think this would be a mistake. That would give a big fat 0 on control factor. Meaning, when a bug or support request is submitted about anything style related, it would be near impossible to assume correctly what font-family is being used (Linux distro's chosen fonts can vary widely in terms of metrics). Because of this, Linux requires a different approach. It's not practical to include every distro's default font in the stack and the three we have now in the stack are far from exhaustive. They're also quite distinct in their design and inconsistent across the board. Could you imagine looking at Ubuntu in the admin all day and switching to Roboto when you got home? It would just be weird. A better approach would be to find a common font between them, a more traditional sans-serif that fits better with the metrics and the feel of the other fonts in the stack. All Linux Desktop varieties have the same options when it comes to applications. In looking at the top 10 distros on ​https://distrowatch.com/ 8 of them come with 'Liberation Sans' installed via LibreOffice by default. The two that don't are (9)elementary OS which uses Roboto as default in it's current beta and (10)Arch Linux which doesn't have a default desktop environment at all. As someone who uses various Linux distros, a consistent experience would mean a lot. comment:84: What can we do to improve alignment of form elements? System fonts: Don't quote single-word font names, per our coding standards. System fonts: Adjust the smaller tabs so they appear as tabs. The tab effect comes from overlapping the border of the box below. Only applies to OSX; testing did not reveal adverse effects in other OSes. Closing this as fixed - please open new tickets for specific issues (including any that might not have been covered above). Missed props will be added to the credits API if necessary. As far as the Linux font goes, I had also noted this during some discussions, but our usage is largely UI elements and does not include much body/longer copy text like GitHub does. As with anything, open to future changes here, but let's make a separate ticket so that doesn't get lost. Form field alignment is also not a blocker for 4.6 - we can investigate this holistically later. This ticket was mentioned in ​Slack in #gdpr-compliance by clorith. ​View the logs. This ticket was mentioned in ​Slack in #core-privacy by pepe. ​View the logs. This ticket was mentioned in ​Slack in #core-editor by pepe. ​View the logs.